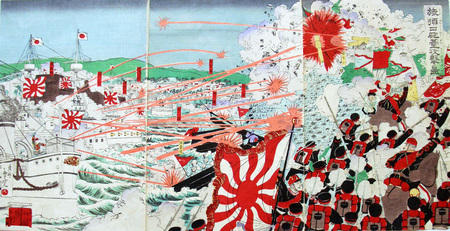 Yoshu Chikakazu (active late 19th century), [Japanese battleships sink Chinese fleet], no date. Three color woodblock prints. 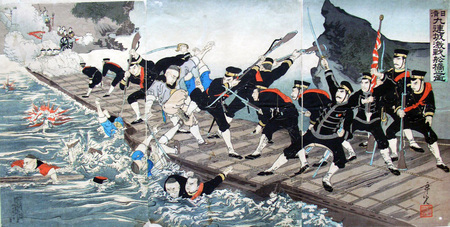 Migita Toshihide (1863-1925), [Heroic Japanese troops march across a pontoon bridge], 1894. Three color woodblock prints. (Meiji 27). 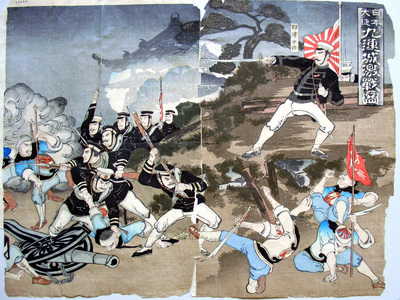 Unidentified Artist, [Sino-Japanese War scene depicting the heroic Japanese battling the Chinese], no date. 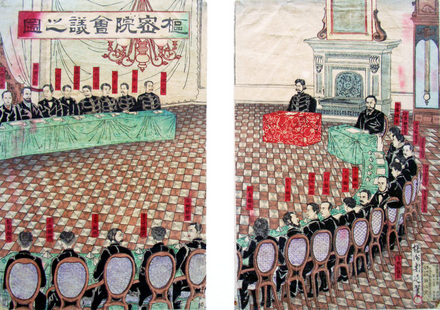 Two of three color woodblock prints. Hashimoto Chikanobu (1838-1912), [Emperor Meiji meeting with his Imperial Council], 1888. Two of three color woodblock prints. (Meiji 21). 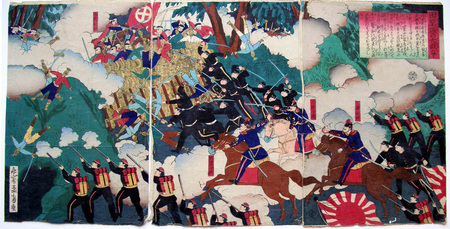 Unidentified Artist, [Imperial forces attacking Satsuma forces during the Satsuma Rebellion], no date. Three color woodblock prints. Adachi Ginko (flourished 1870-1900), [Sino-Japanese battle scene, Japanese navy bombarding a fortress as troops scale the ramparts], no date.